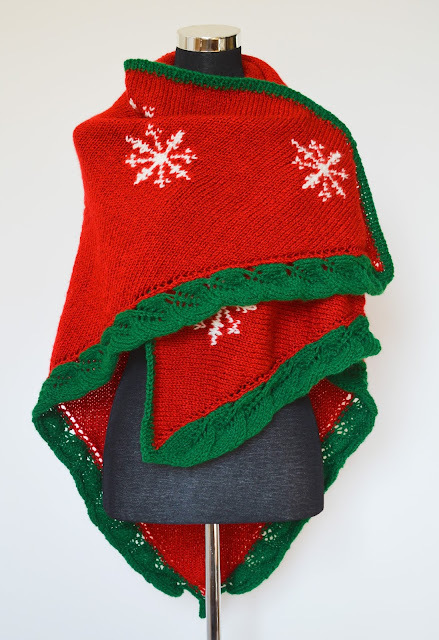 This is the perfect shawl to wear on Christmas eve. Color number 251, Red: 3 skeins. Color number 23403, off white: 1 skein. Color number 98596, Green: 1 skein. *Knitting Circular Needles: 6 mm/ 10 US, 100 cm/ 40 inch long. Gauge: 15 sts * 22 rows in 10x10 cm/ 4x4 inch, (stockinette pattern). ssk: Slip next 2 stitches knitwise one at a time. Pass them back onto left-hand needle, then knit through back loops together. p2togtbl: purl 2 stitches together through back loops. 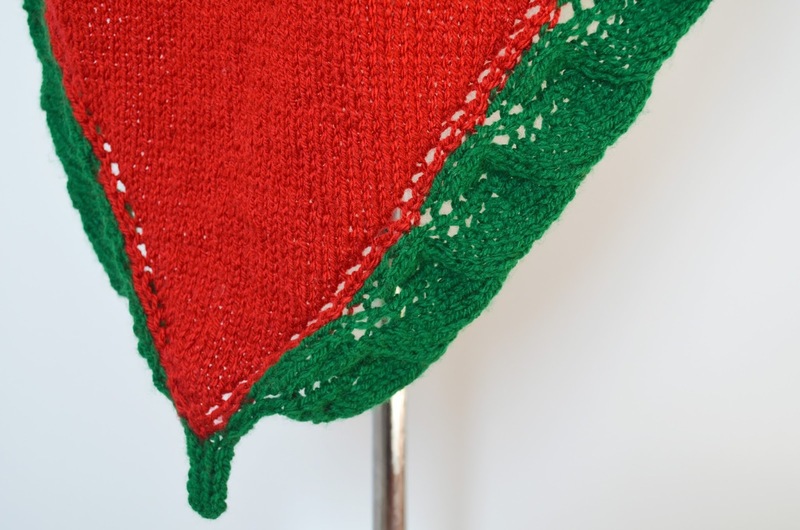 Always mark the center st of the shawl. 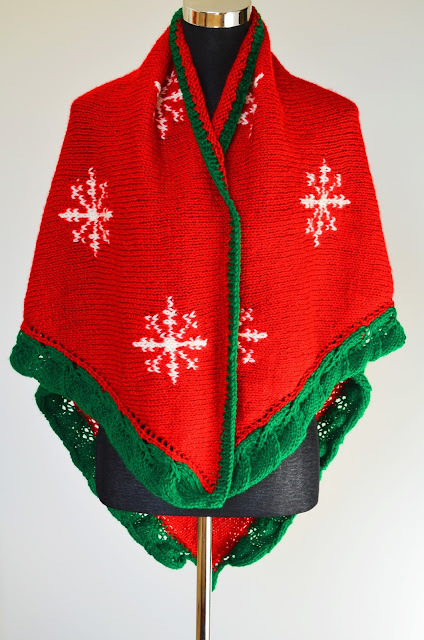 The row are written in colors to clear which stitches are worked either in red or green. With green yarn, cast on 5 stitches. Row 1: k 2, p 1, k 2. Row 2: p 2, k 1, p 2. Repeat these 2 rows twice more. Row 1: k 2, bind on red yarn, k 1, k 2. Row 2: p 2, p 1, p 2. Row 3: k 2, m 1, k 1, m 1, k 2. Row 4: p 2, p 3, p 2. Row 5: k 2, k 1, yo, k 1, yo, k 1, k 2. Row 6: p 2, p all red sts, p 2. Row 7: k 2, k 1, yo, k 3, yo, k 1, k 2. Row 1: k 1, yo, k 1, yo, k 1, yo, k 5, yo, k 1, yo, k 1, yo, k 1. Row 2: p all green sts, p all red sts, p all green sts. Row 3: k 2, yo, k 1, yo, k 1, k 1, yo, k to last st, yo k 1, k 1, yo, k 1, yo, k 2. Row 5: k 3, yo, k 1,yo, k 2, k 1, yo k to last st, yo k 1, k 2, yo, k 1, yo, k 3. Row 7: k 4, yo, k 1, yo, k 3, k 1, yo k to last st, yo k 1, k 3, yo, k 1, yo, k 4. Row 9: k 5, yo, k 1, yo, k 4, k 1, yo k to last st, yo k 1, k 4, yo, k 1, yo, k 5. Row 11: k 9, k2tog, yo, k 1, yo, k 1, yo k to last st, yo k 1, yo, k 1, yo, ssk, k 9. Row 12: p 8, p2togtbl, p 3, p all sts in red, p 3, p2tog, p 8. Row 13: k 7, k2tog, k 1, yo, k 1, yo k 1, k 1, yo k to last st, yo k 1, k 1, yo, k 1, yo, k 1, ssk, k 7. Row 14: p 6, p2togtbl, p 5, p all sts in red, p 5, p2tog, p 6. Row 15: k 5, k2tog, k 2, yo, k 1, yo, k 2, k 1, yo k to last st, yo k 1, k 2, yo, k 1, yo, k 2, ssk, k 5. Row 16: p 4, p2togtbl, p 7, p all sts in red, p 7, p2tog, p 4. Row 17: k 3, k2tog, k 3, yo, k 1, yo, k 3, k 1, yo k to last st, yo k 1, k 3, yo, k 1, yo, k 3, ssk, k 3. Row 18: p 2, p2togtbl, p 9, p all sts in red, p 9, p2tog, p 2. Row 19: k 1, k2tog, k 4, yo, k 1, yo, k 4, k 1, yo k to last st, yo k 1, k 4, yo, k 1, yo, k 4, ssk, k 1. Row 20: p2togtbl, p 11, p all sts in red, p 11, p2tog. Repeat rows (11-20) 7 more times. Before beginning the eighth time repetition of the green leaf pattern, mark the center stitch of the shawl. When you reach the center stitch working row 11, bind on white yarn and knit it white. 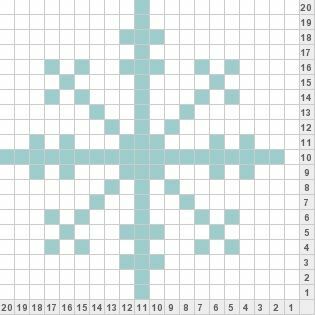 it is the first row of the snow flake, follow the 19 rows snow flake pattern, that almost equals two times repetitions of the 20 rows of leaf pattern. 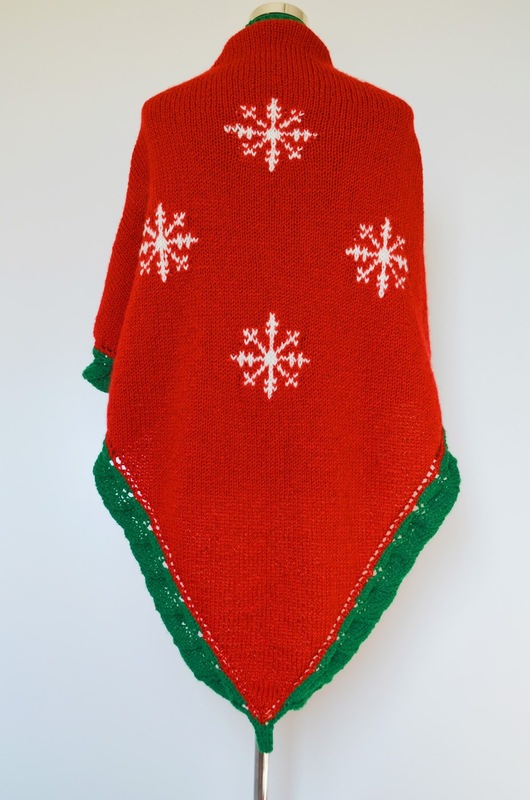 cut white yarn after finishing last white st in the center of shawl, and work row 20 of leaf pattern. Repeat one more green leaf pattern (11- 20 rows). The two snow flakes first row sts are the twenty fifth st on each side of the center st mark of shawl. work them in the same time with another two repetitions of leaf pattern. 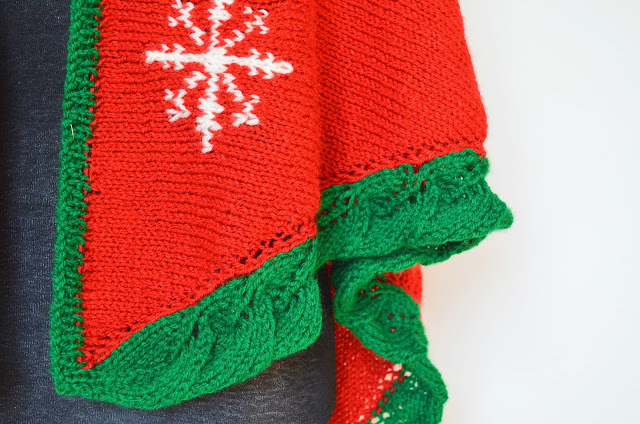 One at the center of the shawl. The two others positions are at the fiftieth sts on each side of the center st of shawl. Work them in the same time with another two repetitions of leaf pattern. The two left side snow flakes positions are at the twenty fifth and fiftieth sts from the center st. The two right sides snow flakes positions are at the twenty fifth and fiftieth sts from the center st.
Row 1: k 5, sssktog, k 4, k 1, yo k to last st, yo k 1, k 4, sssktog, k 5. Row 2: p 10, p all sts in red, p 10. Row 3: k 4, sssktog, k 3, k 1, yo k to last st, yo k 1, k 3, sssktog, k 4. Row 4: p 8, p all sts in red, p 8. Row 5: k 3, sssktog, k 2, k 1, yo k to last st, yo k 1, k 2, sssktog, k 3. Row 6: p 6, p all sts in red, p 6. Row 7: k 2, sssktog, k 1, k 1, yo k to last st, yo k 1, k 1, sssktog, k 2. Row 8: p 4, p all sts in red, p 4. With green yarn, work 3 rows in simple ribs pattern (k 1, p 1), cast off all stitches. Weave in loose ends, block the shawl. Hello, and welcome to my blog. I've been crocheting and knitting for more than 40 years. Now that my kids are all grown up, I have more time for my hobbies. 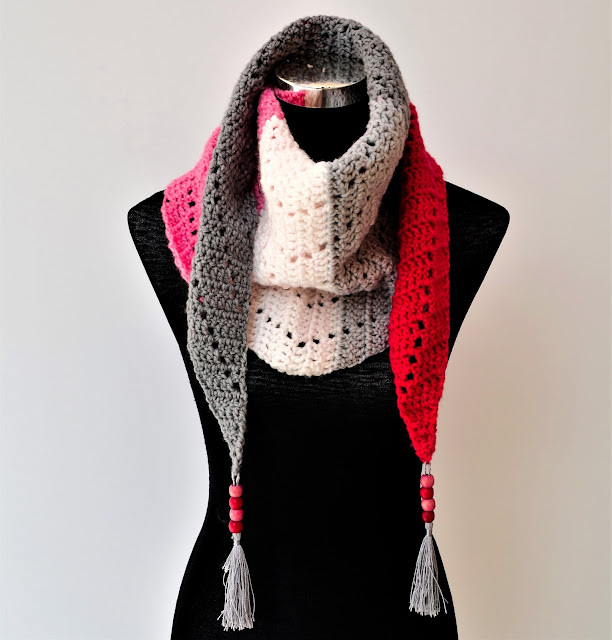 and I decided to share my love for crocheting and knitting through this blog. I hope you like my creations.